The best idea in the world isn’t an automatic business success. There’s execution, timing, and finding and addressing the right market. We can help you execute your idea – without the expense of building something unproven. You can’t validate your idea without a prototype. 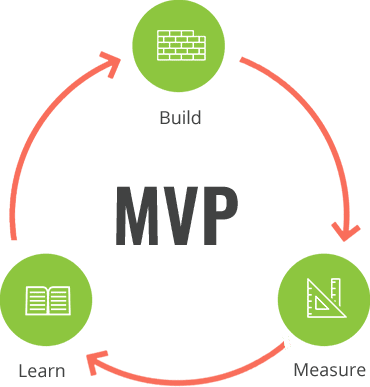 Prototyping will give you an MVP (minimum viable product) that you can put in front of potential customers or users to gather feedback. This process is an important step in the development cycle, and will save you truckloads of money, and months of heartache. Your essential insights will be made accessible within weeks, and at a fraction of the cost. Instead of starting with custom software application development, we highly recommend testing your idea first with a prototype. LET’S GET CLEAR ON GOALS. There a lot of industries that collect and use personal and financial information. Industries like finance, real estate, and healthcare are just a few good examples. If the information you collect gets into the wrong hands, it could ruin your customers’ lives. It could ruin your business, too. You’ll need the right software in place to comply with industry regulations, or even customer expectations. Off-the-shelf software is a big target for hackers, and if you use it then your data is at risk. Customized software can address your strict security and privacy requirements. If you make a great app, your users will constantly interact with it in many different ways. Our prototyping process focuses on the most important user interactions, with emphasis on your users. We’ll make sure that their interactions are consistent, seamless, and their expectations are met every time. The app in your head isn’t quite real yet. Even with the perfect strategy in place, you’re making hundreds, or even thousands, of assumptions about the app and your users. The UX and prototyping phase allows us to build enough to test your key assumptions, and see if they can be validated or refuted. While we’re field testing your prototype, we’ll also listen for marketing and sales insights from your users. If you listen closely, people will tell you what they want, what they’ll buy, and how they plan to use it. We’ll record this data and bring it back to you as a supplement to your strategy. Build fast. Fail fast. Adapt. One key thing you need to embrace about prototypes is that they’re intentionally designed to be fast and imperfect. Since you (or we) will be improving your app later, we emphasize speed of launch and learning. Ready to take the first step with your big idea? We’ll partner with you to prototype and test new concepts quickly to bring them to life. If you’re a progressive leader with a big idea, we’d love to discuss your goals.